The price feels right for this high-spec full HD unit and it has a good selection of key features, so I have no reservations in recommending it. Sanyo's Z Series LCD projectors have given us some cracking 1080p models at aggressive price points – and now there's a new flagship. The Z4000 keeps to the formula and packs in high-end features like optical lens shift, while the price hits a new low. The most exciting area for home cinema projection is the entry-level full HD arena, for it's here that you'll find the hottest competition between brands and projectors, with 1080p resolution and 100Hz processing changing hands for little more than a grand. Sanyo has competed strongly here in the past, and the new Z4000 wades right in with its 3LCD technology and motorised lens cover. 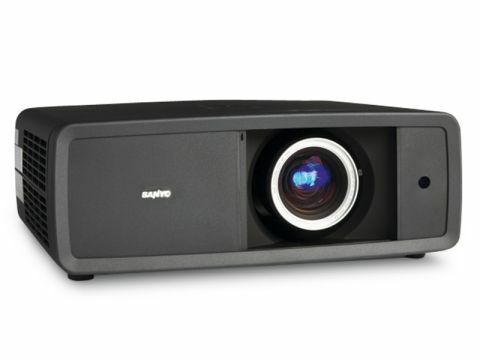 What you're getting is a full HD 3LCD projector with a bright 1,200 lumens lamp and features such as optical lens shift and 100Hz motion processing that you won't find on a sub-£1,000 model. The dynamic iris also enables it to boast a 65,000:1 contrast ratio, while its operating noise level of 19dB is as quiet as projectors get. But it's nothing new when compared to the outgoing PLV-Z3000's spec sheet. In fact, the only changes beyond the cosmetic are a reworking of the optical components and power supply to ensure it uses less than 1W in standby. If it's not broke, don't fix it, seems to be the philosophy. At least the recommended retail price is a little lower than the Z3000 at launch. The finish is now a light absorbing, matt black, so in a dark cinema room, it all but disappears with just a little light leakage from the side vents. It has the same form factor as previous Z models, which is very plain, but quite compact, so that it cuts a very unobtrusive profile when mounted on the ceiling. It's fairly well connected with two HDMI sockets at the rear, two component inputs and a PC interface. Sadly, there are no extras such as an SD card slot or USB port. The lens collar offers manual zoom and focus and it feels slightly loose, which means there is a tendency to defocus over time and you'll find yourself making adjustments before each film. Yet the vertical and horizontal lens shift at the side is a godsend when it comes to lining up the picture, especially as the lens in this unit is mounted slightly off-centre. These controls also have some play in them, but at least you have a lock switch to stop your whole image drifting off the screen. The accompanying remote has brightly backlit buttons and lots of them, so you'll find shortcuts to all of the main picture adjustments and keys for each source input. Combined with the useful lens shift feature, it all adds up to a very quick and easy installation procedure. Calibration, on the other hand, takes a little longer, as there are no helpful test patterns provided and the scales for each parameter jump in big steps, so you'll be tinkering for some time before achieving an optimum picture. There are also six preset picture options to choose from with varying degrees of overly-pumped colours or washed-out black levels, but 65,000:1 Natural provides a decent balance and makes a good first impression of this projector's abilities. The lamp is no brighter than the previous model and as per the Z3000, it needs a really dark room to get anywhere near its claimed contrast ratio. With daylight banished, though, you can achieve quite dark blacks, vivid colours and reasonable greyscale definition. More impressive, however, is the overall effect, which is rewardingly filmic. This is down to the way the sharp 1080p resolution of the 3LCD chipset is tempered with image processing that hides the panel structure of the LCD chips, giving a smooth, but highly resolved image. It is helped here by the 100Hz processing, which ensures there is no judder during camera pans and no jerky movement on screen.